Seems there's a whole production line of 4k models. So you still have to get the recorder plus the ssd. Maybe $9000 is not the best deal? An interview that gives some background to the camera. 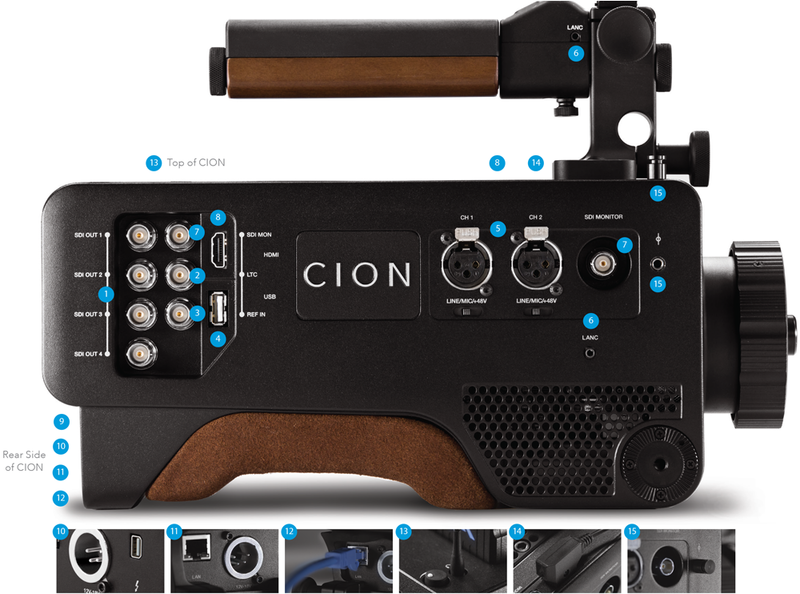 Here's a PVC interview about the Cion workflow. MTF are debuting Cion lens adapters. Looks like a nice camera, however I think it is a disappointment that it can't record 120fps to the in camera cards like you can with the Alexa. I suspect the recording media in this price range wouldn't be up to recording 120fps, at least not without windowing the image. The recording media is in my view actually alarmingly expensive, considering that commodity flash of similar capacity and performance is available for less money. Either way, it's a choice of how much buffering you want to provide, how you want to handle recording it, and how much compression you want to use. After all, the FS700 will do 960fps to flash cards - eventually, and if you're happy with 25Mbps. But in general I'm very suspicious of people dreaming up new flash formats. The justification most often given is that of physical robustness. 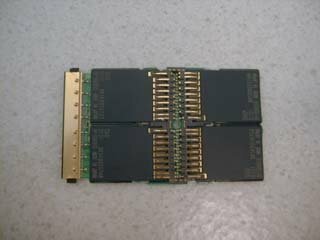 This was valid back when SATA connectors were intended for a few dozen insertions in RAID arrays, but the industry has recognised this and the datasheets for modern SATA connectors specify much greater capability. Beyond that, vendor lock-in and price gouging on what's frankly fairly everyday technology seems to be the order of the day. To think... I paid $8000 for 128GB of P2 cards five years ago. Grrr. Shall we call you Mr. Early Adopter? I started with the P2 system in 2005 but I hardly ever use it anymore.To be honest, the P2 cards and camera paid for themselves several times over so I should not complain. Panasonic's tech and media format never once failed me either. I just wish I could re-purpose the cards in an on-board recorder or something. They're almost certainly each made of four SD cards, which you can quite literally rip out of them if you feel like it. This might be useful in a sony NEX camera, GH series DSLR, or audio recorder. I'm not sure what class of SD card they'd effectively be. I seem to recall that they won't just format as PCMCIA mass storage. I've seen other designs than that where they would pop out. Hmm. Desoldering braid? I"ve been holding off on a 4K camera for a while. I'm giving this one a shot since the price tag is reasonable. Three 512 drives and a Pak Dock came to about $4,000. However considering the same type of media with a reader for the F55 would be closer to $6,000, I think it's within the market. The RAW situation is a little weird as it's not straight up RAW to the Kipro as actual clips that you can use in an NLE with Pro-Res Proxies like the F55. The raw seems to be only available through the Thunderbolt as data to a laptop with Debayering software. or through 3GSDI to a "corvid Ultra" like box for display purposes. But nothing is available for field recording of RAW. This seems a little clunky but perhaps there will be a 3rd party raw recorder. I don't understand it at all. Why doesnt' the KiProQuad take care of that? However they seem super confident that the Pro-Res 4444 renders RAW kind of redundant anyway. Which I love in theory but I don't know how convinced others will be about that. I asked last week about the color space, log gamma and ISO as well but there's "No information at this time". Which has me worried that the "summer" release may be pushed back. MTF said the mounts are going to be ready in about 4 weeks. Tried to order through B&H but there's no sku yet. Anyone learns anything about the actual recording specs keep us posted. To the original point of the thread, I do rather like the look of Cion. I hope they offer an HD sensor windowing mode. Makes it much more applicable, with B4 lenses, to documentaries. I still have the HPX and the cards. It's makes a good run-n-gun b-roll camera when I need that, which ends up being about 2 days a year. According to AJA there currently is no way to record 120fps or RAW in any frame rate without being tethered to a computer via thunderbolt. The spec sheet is seriously misleading. I don't think this is intentional on their part. I have suggested that they reword all of that so it's more clear. In all likelihood there will be future updates as time goes on and more features hopefully but for right now, it's 4444 4K at up to 30fps and 422 4K at up to 60fps. Raw is an afterthought that is possible but more theoretical at this point since someone else apparently has to write the debayering software application or create the device. The upside is that the signal is promised to be of such a high quality that Raw is unnecessary in most cases. But that remains to be seen. Just wish they could have included the 120fps feature at a lower bit rate or resolution at least. Perhaps in a future update. To be honest, nobody really has to write much software to do debayers anymore. A front end, maybe, but there's perfectly decent open code for actually doing the heavy lifting. I'm very much looking forward to using (hopefully buying) the CION. I think I've figured out a more cost effective configuration of the CION by forgoing the AJA Pak media cards and reader and get the Atomos Shogun monitor/recorder for roughly the same price. The Shogun will record 4K at least at 30p to ProRes HQ or CinemaDNG RAW on 2 SSDs or SSHDs of my choosing. Now I have my most used frame rates and preferred codecs plus a great field monitor. (You could go with an Odyssey 7Q for a more money but then your stuck using another proprietary media card) Zacuto's Gratical OLED EVF looks like a promising addition for the CION but that's another $3k. After talking in person with the guys from AJA a few times they have yet to confirm anything about the ISO range and also if there will be an ability to use different picture profiles such as Sony's S-LOG 2 or Canon's C-Log. They have axed the ability for 3D LUTs however. It was disappointing to see that there is only one media card slot rather than two for hot swappable media. At the end of the day you can spend less than $15k and have a killer 4K camera that feels and acts like a real camera. The Blackmagic URSA is much cheaper but has HUGE drawbacks for me and my usual production needs. For me, the CION is the sub $20k camera to have (final conclusion will be made once we get the final production specs and actual footage to view).